Tax incentives for upgraded energy efficient projects provide excellent opportunities for U.S. hospitals. It is estimated that U.S. hospitals spend more than $6.5 billion annually on energy costs. A one million square foot hospital uses 2.5 times the energy as a similar sized office building. The average U.S. hospital spends over $6.00 per square foot on energy, according to the EPA. Since the average hospital is about 288,000 square feet, this translates to $1.75 million a year in energy costs. Due to the high energy costs in the industry, however, there is an opportunity for substantial energy cost reduction. According to the American Hospital Association, the average total margin for U.S. hospitals is about 5 percent. Cutting energy costs $1 per square foot is equal to adding $20 per square foot, or $5.76 million, in new revenue for the average-sized hospital . That $1 per square foot energy reduction target is not out of reach for many hospitals. In U.S. hospitals, energy savings from sustainability projects often reduce utility bills by over 30% annually. If building systems haven’t been upgraded in a while, the savings can be even greater. According to a 2010 report by the National Renewable Energy Laboratory, large hospitals can achieve savings of at least 50% over ASHRAE 2004 building code energy standards. Besides the energy cost savings, hospitals have additional favorable reasons to upgrade their energy equipment. The reliability of hospital energy systems is a top concern for healthcare facility management. Critical hospital energy systems must be online and available 24 hours a day, even when the power grid is compromised. Furthermore, energy upgrades can enhance patient care. Hospital officials report quality patient care as the number one priority to improve patient experience according to NYSERDA (New York State Energy Research & Development Agency). Replacing aging, inefficient HVAC units can improve patient comfort by reducing noise and improving overall air conditioning quality so patients can rest. Additionally, sustainable facilities help keep employees on staff, according to a recent report by NYSERDA. Within the next 10 years, approximately 40% of doctors and one-third of nurses will retire, creating shortages of skilled medical professionals. Sixty-five percent of healthcare decision makers say sustainability is essential to recruitment, given the increasingly social conscious workforce which no longer prioritizes salary as the number one incentive when considering job placement opportunities. Federal & state tax initiatives provide excellent incentives for energy project upgrades. Many hospitals fail to consider the effect of tax incentives in their ROI calculations when considering lighting projects. Other hospitals are often completely unaware of the benefits even after completing a lighting project. The good news is that even after the lighting project has been completed, the tax provisions can be taken retroactively. 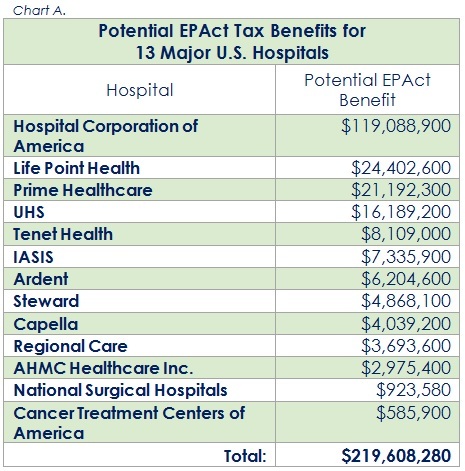 For hospitals that upgrade their energy systems, the EPAct tax benefit can be quite substantial. Chart A. demonstrates the potential EPAct benefits for thirteen major hospitals in the U.S.
At hospitals, HVAC systems are the largest driver of energy costs. Not only do they heat, cool & ventilate the building but they also improve indoor air quality, mitigate the transmission of airborne disease and provide comfort for patients. Hospital HVAC systems are also specially designed to meet infection control criteria while being reliable, low-maintenance and energy-efficient. Critical rooms such as operating rooms, isolation rooms, pharmacies, labs and imaging suites are all specially designed with particular parameters in mind. Hospital HVAC systems have other unique features as well. Unlike many facilities, hospitals have year-round cooling loads, even in cold temperature environments and even during the winter. 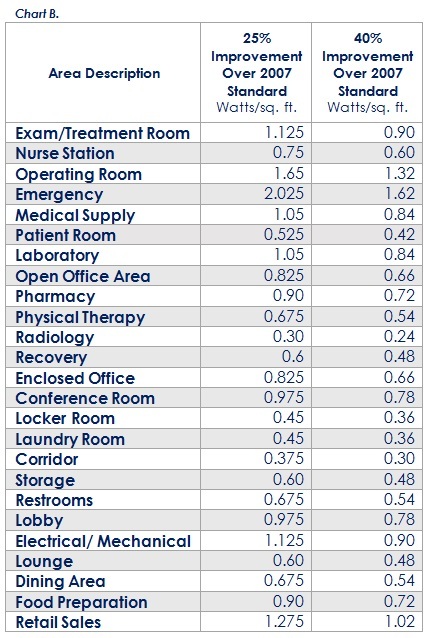 There are numerous factors unique to hospitals that drive demand such as their low surface-to-volume ratio (which means more HVAC capability is needed than other facilities). Moreover, hospitals contain numerous systems and devices that produce significant amounts of heat, such as imaging systems, refrigerators and intense lighting. All of these factors mean added complexity, which, consequently, attributes to increased opportunities for beneficial upgrades as technology continues to advance. Like hospital HVAC systems, hospital lighting systems are unique as well. Lighting system designs within hospitals are intricate and sophisticated. Architects, engineers, lighting designers, and design-and-build electricians that make qualifying energy efficient lighting systems in government, VA, state, county, and city hospitals may take EPAct tax deductions. Patient-perceived quality of light and the effects on a healing environment are a critical factor in modern hospital lighting design systems. Hospital lobbies create first impressions for healthcare facilities and are often a determining physiological factor when patients and family evaluate hospital alternatives. Architectural, accent, and general lighting all need to be considered when designing these important spaces. Reception areas are important as well. These small but critical areas in a healthcare setting can set the tone for the entire patient or visitor experience. Many modern hospitals take cues from upscale hotels and feature grand desks and counters with strategically placed lighting fixtures that have sophisticated interactions with each other and the surrounding room. Examination rooms have evolved in recent years from stark and institutional to comfortable and aesthetically reassuring. Indirect lighting and the ability to switch the level of lighting intensity here is critical. Proper placement of luminaires, calculated combinations of recessed indirect and direct lighting interactions and additional lighting above and below work surfaces and counters all create sophisticated modern lighting designs in this environment. Lighting systems in corridors and hallways are carefully designed as well. Visual tactile lighting clues help patients, staff, and visitors navigate around hospitals and facilitate movement from one place to another. Proper lighting design can actually expedite the flow of traffic as well as combat patient and caregiver fatigue. Lighting systems in patient rooms are especially important. The patient room is one of the most widely debated and researched spaces in modern healthcare facilities. Healing environments can be significantly altered by lighting conditions. The physiological effects that lighting can have on patient health and the healing process cannot be understated. Here glare or excessive brightness must be eliminated, lighting must be controlled to balance the circadian rhythm and observation must be conducted with not only maximum effectiveness but with minimum disruption as well. There are other hospital areas that are significantly affected by lighting conditions as well. Lighting in nursing stations should be designed to maximize productivity, reduce errors and lower stress. Due to the intense magnetic polarity created by MRI suite diagnostic equipment, luminaires must be constructed of non-ferrous materials such as aluminum, brass, certain types of stainless steel, and polymers. Hospital parking garages present excellent opportunities for EPAct lighting deductions. Many hospitals have large multi-tiered parking garages encompassing many square feet of lighting space. Under the current law, EPAct parking garage deductions are available for both new and existing building lighting projects completed between January 1, 2006 and December 31, 2016. IRS Notice 2008-40 Sec. 6 specifically references parking garages as eligible buildings. Tax incentives for energy efficiency upgrade projects provide excellent opportunities for U.S. hospitals. Many hospitals upgrade their energy systems even before considering the potential EPAct benefits. Often times they are eligible for substantial EPAct tax deductions that they are unaware of. These deductions can provide millions of dollars in funding that can be used for other important purposes.